There are a lot of ways to be more creative in your public speaking. 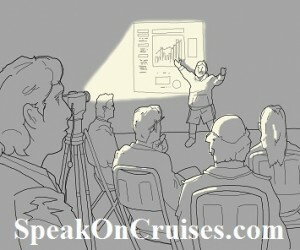 I am particularly interested in how to make my cruise ship lectures better = more appealing, more entertaining, more fun, more educational, more reasons for attendees to be glad they came and brought someone else. I have a list of 20 steps, keys, ideas, strategies, thought processes that the speaker or lecturer can implement in order to make their presentations more creative. 1. Live and function on the edge. If all the speaker does it what they are always used to, new thoughts will never come into the equation = no creativity. Stake stock in what works for you and what doesn’t. Then push it a bit. At the very basic level, for example, try a new or stronger adjective. Reword your theme to make it more appealing or have a different twist that will require you to think differently in order to drive it home. Try a different image or video to get your point across. Go out of you way to do just one thing to give your presentation impact. Another example, again very basic, try varying your speed, your intensity, your word choice, your cadence. There are lots of things you can push just a little that you may have been wanting to for some time now. Push it and watch your creative juices flow AND your presentations become better.